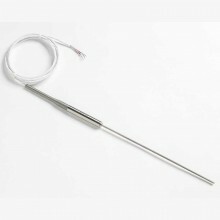 The Fluke 5627a RTD temperature probe is an excellent value for a precision thermometer. It has the price-to-accuracy and price-to-durability ratios you should demand in all of your precision thermometers. The Platinum Resistance Thermometer (PRT) models 5627A is designed to be a secondary standard interpolating instrument converting temperature to resistance. 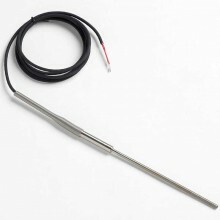 The 5627A may also be used as a temperature standard for calibration of industrial sensors. 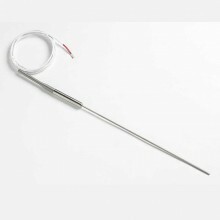 The PRT is used with a readout device to detect temperature changes or actual temperature. The Fluke 5627A-9 is manufactured using a coil suspension element design for increased shock and vibration resistance. It has a mineral-insulated sheath with a minimum bend radius of 19 mm (3/4-inch) for flexibility and durability. (Bend, if any, should be specified at time of order). Please Note: When ordering please specify the termination you require. ie. 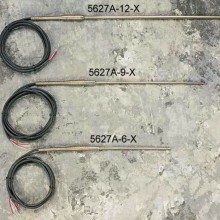 Fluke 5627A-9-G (gold pins), plus the Bending Radius required. Specify “A" (INFO-CON for 914X), “B" (bare wire), “D" (5-pin DIN for Tweener Thermometers), “G" (gold pins), “I" (INFO-CON for 1521 or 1522), “J" (banana plugs), “L" (mini spade lugs), “M" (mini banana plugs), “P" (INFO-CON for 1523 or 1524), or “S" (spade lugs). Secondary PRT, 229 mm x 4.7 mm (9 in x 3/16 in), –200 °C to 300 °C. NVLAP-accredited calibration included, lab code 200706-0. Bending Radius: Sheath may be ordered with a bend on a minimum radius of 19 mm (3/4 in) except for 50 mm (2 in) area of sheath near tip. 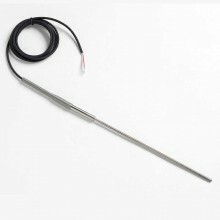 Temperature Coefficient 0.00385 Ω/Ω/ °C nominal. 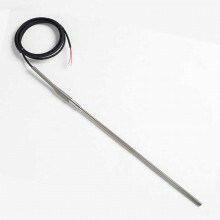 Temperature Range −200 °C to 420 °C (5627A-6 and 5627A-9 to 300 °C; transition and cable temperature: 0 °C to 150 °C). Drift Rate (k=2) ± 0.04 °C at 0 °C after 100 hours at 420 °C. Sheath Material 316 Stainless Steel. Leads PTFE-insulated, nickel-plated stranded copper, 22 AWG. 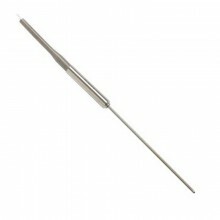 Bending Radius Sheath may be ordered with a bend on a minimum radius of 19 mm (3/4 in) except for 50 mm (2 in) area of sheath near tip. 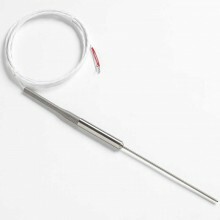 (Fluke lab requires 20 cm [8 in] of unbent sheath to re-calibrate.). Calibration Includes manufacturer's NVLAP-accredited (lab code 200706-0) calibration and table with R vs. T values in 1 °C increments from -196 °C to 500 °C (to 300 °C for 5627A-6 and 5627A-9). Immersion At least 100 mm (4 in) recommended. ± 0.124 °C at 420 °C. Dimensions 229 mm x 4.7 mm (9 in x 3/16 in). PDF User's Guide to the Fluke 5627A RTD Temperature Probe.